Sushi Master has a great range available at wholesale pricing including sushi rolls, naked (reverse) sushi rolls, temaki, hand rolls & cocktail rolls. This includes a range of different sizes, package and labeling options . 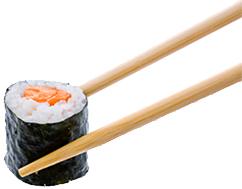 We also offer a complete range of rice paper rolls , nigiri, spring rolls and a range of Japanese specialty items like Wasabi, chopsticks & individual soy sauce fish. We can custom design to suit your needs and we offer great savings for volume purchases.